These axes are closely linked to each other. Motion analysis provides autonomous virtual humans with control laws, rules and hypotheses that are embedded in the models. This helps to reach the second objective, e.g. making virtual humans behave, move and interact as real people would do in the same situation. 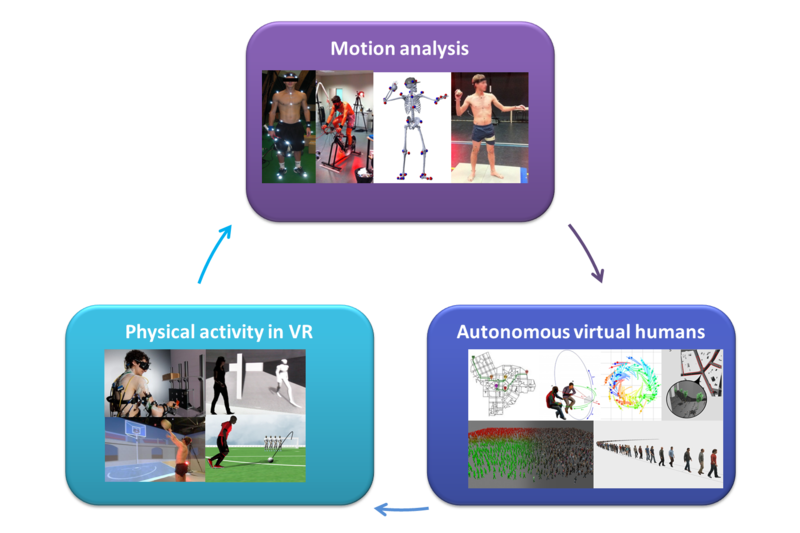 Models and simulators developed in “Autonomous virtual humans” are then used in “Physical activity in VR” with two main goals: 1) developing immersive methods to train complex motor skills, and 2) validating the virtual human models by analyzing whether real users perform realistic and natural interactions with the autonomous virtual humans. Analyzing this interaction also provides relevant information to improve fundamental knowledge about perception-action coupling in human activities.